Emphasis on Nutrients Over Ingredients. Nutrena understands that nutrient content of ingredients varies widely based on seed type, climate, soil, and processing methods. They formulate their feeds accordingly to assure that every bag of Nutrena® horse feed delivers optimal nutritional value. Verified Nutrition Analysis. They are able to select the most appropriate ingredients because they maintain current nutrient values for over 180 different ingredients from over 1100 suppliers. Their data bank allows them to verify that the ingredient composition of our feeds meets specific, consistent nutrient levels. Proper Nutrition for Optimum Performance. Meeting minimum nutrient needs may result in horses achieving only minimum performance standards. By the same token, excessive quantities of a nutrient may have a negative effect on performance. 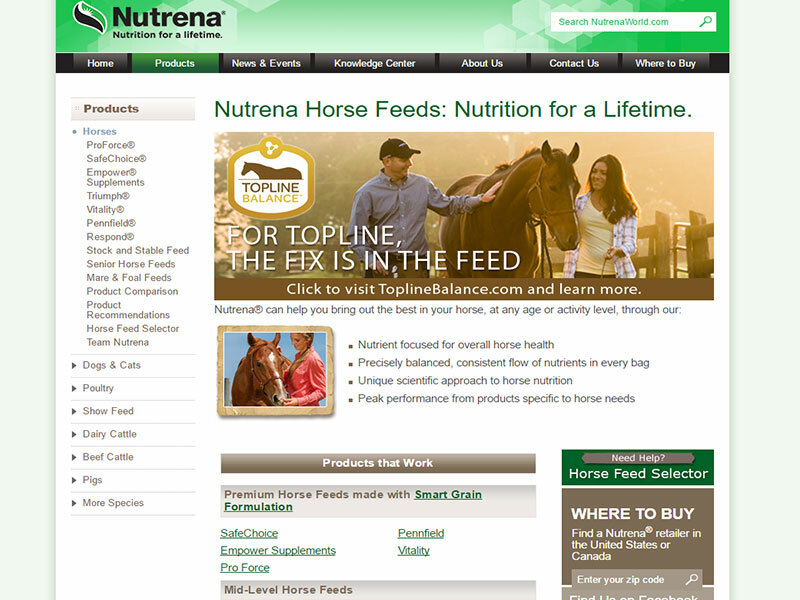 Nutrena takes into consideration all these variables when formulating a horse feed.